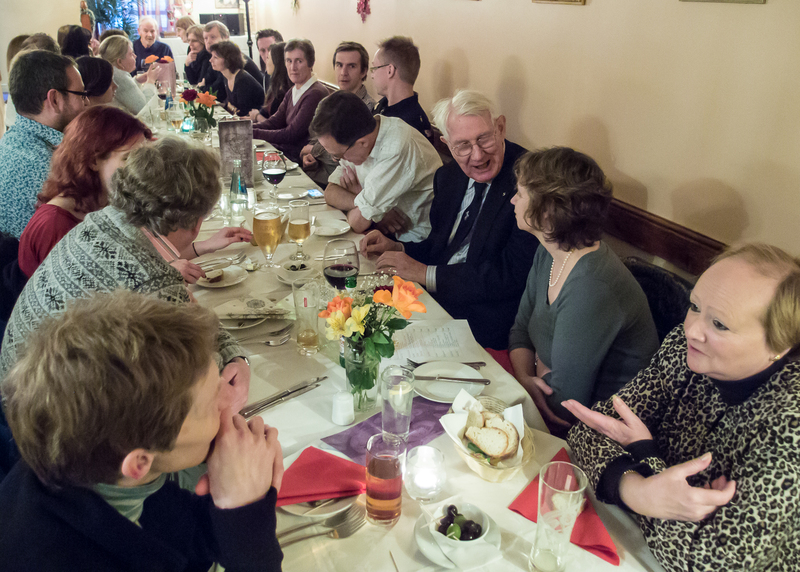 This year the YTI Christmas lunch was held in an Italian Restaurant in Leeds, Viva, 9-11 Bridge End, less than 10 minutes walk from the railway station. We were accommodated in a private room downstairs where all 27 of us could sit round one long table with sufficient room for the waiters and waitresses to walk down both sides. We had all pre-ordered from one of two menus and soon the food began to arrive. I had chosen Atlantic Prawns and Smoked Salmon for the first course. Next came Medallions of Fillet Steak and all the Trimmings with a Slice of Italian Christmas Cake to finish. There were several other choices for all three courses which all looked good. Needless to say there was plenty to drink and a couple of glasses of beer helped the food go down. But it is not only the food that is important at these occasions. It is nice to be able to talk to other translators who do similar language combinations and to renew old friendships. Freelance translators live a solitary life at work but on these occasions the sound of conversation can be deafening. As a Trados fan it was interesting to compare notes with people who use MemoQ and Déjà Vu and hear stories of how various agencies take a long time to pay and others will pay extra for working at the weekend. Most of us have to face up to the prospect of having to buy a new computer every 4-6 years and this becomes more complicated if you need to transfer all the data you have collected from your old computer to the new one. It was interesting to discuss this with other translators. As I walked back to the station I could not help thinking that it is at these occasions that one makes contacts that can be helpful during the coming year. Networking is very important for freelances and it is always nice to enjoy a good meal with sociable people. My thanks to the committee for organising it and to the staff at Viva for providing it. Having left what we thought was sufficient time to get to York for the quiz, a combination of heavy traffic, road works and fog meant we only just made it before the scheduled start. Numbers were sufficient to make up six teams to contest the quiz held at the Yorkshire Terrier pub on Stonegate in York. Catherine Greensmith took the role of quiz master and, having placed our food orders and got the drinks in, we all settled down for the first set of 20 questions on subjects ranging from geography and history through pop music and musicals to children’s literature. Some questions generated a good deal of whispered debate at many of the tables but it was soon time to swap answers with the next table in time honoured fashion. There was a moment of controversy when the answer to one question on Australian geography was challenged by a former resident but Catherine quickly moved to allow 2 correct answers to that one. Alas, my team had neither answer! At the end of round one only a couple of marks separated all the teams and we were all ready for some refreshments. The half-time chilli proved to be rather hot and spicy – too hot for some – but the chips were excellent and once everyone had had their fill it was on to round 2. Again the questions covered a wide variety of subjects with S Club 7 and Bob the Builder figuring amongst the answers. Once the round 2 marking was complete Team No.6 were declared the winners by a single point from team Awesomeness with French Leave a further point behind. Translation Assemble took forth spot just ahead of Gravity Never Failed, with the Latecomers completing the positions. Chocolates and wine were the reward for Team No.6 whilst the Latecomers, having failed to overcome the handicap of a late start due to travel difficulties, literally picked up the wooden spoon. Thanks to Catherine for keeping order and to everyone who participated and donated to the charity collection.